If I counted which recipe I get the most requests for, it'd probably be bo kho (Vietnamese beef stew). It's not that I dislike bo kho. It's that I'm incapable of cooking in small quantities. So I have to be in the mood for a whole lot of bo kho. In college, I used to make a pot of soup and eat it all week long. Soup seems to be the only thing I don't mind eating again and again. And if it's a tomato-based soup with oxtails, I relish eating each bowl. But it wasn't until after the break-in, when my aunt brought over a bowl of bo kho and some sliced bread, that I was reminded of just how much comfort a bowl of Vietnamese beef stew provides. Bo kho's distinct taste comes from the use of lemongrass, ginger, star anise, cinnamon, Vietnamese Indian Madras curry powder and Chinese 5-spice powder. The deep red color isn't just from tomato paste but also the use of annatto seeds. The stew needs to simmer for at least several hours to maximize flavor and for fall-apart tender beef. I prefer using a combination of beef stew meat and oxtails. The oxtails will result in a much deeper, richer flavor. You could certainly add tendon as well. Add the vegetables in the last hour of stewing so they don't become mushy. And like most stews, it's even better the next day, and the day after that, and the day after that. I Facebooked (Yeah, it's a verb now.) my cousins and friends to offer them some bo kho, but none took me up on it. So I ate it all by myself. It took me a week. And it was good every single time. Serve with with a squeeze of lime and basil, and with rice or flat rice noodles. You'll need about 1 lb beef stew meat and 1 lb oxtails. Wash and set aside. 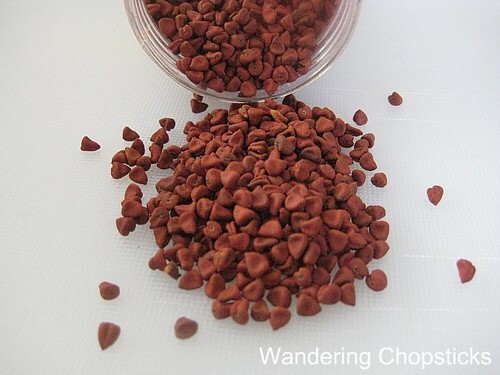 Annatto seeds provide the deep rich red color and a slight sweetness to the stew. 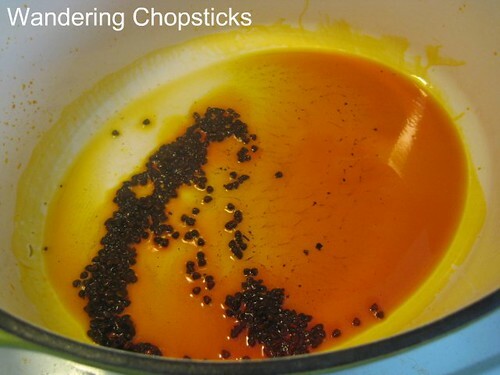 In a large pot on high heat, add 1 tblsp of annatto seeds to 2 tblsp olive oil. The seeds will start releasing their color. Be careful! The seeds may pop in the oil. Keep stirring until the oil turns red. Scoop out the seeds and discard. Sprinkle about 1/2 cup flour over the beef, making sure to coat each piece. Pan-fry the beef and oxtails until each side is brown. You may have to do this in batches. I just move the oxtails to one side of the pot and stack them on top of each other. When the beef is all browned, add any remaining flour to the pot. It'll help thicken the stew. 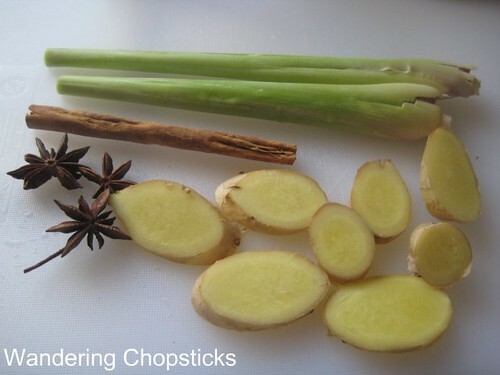 Add two bruised lemongrass stalks, ginger slices, a stick of cinnamon, and 3 star anise pods. Also add 1 bay leaf, 2 tsp Chinese 5-spice powder, 2 tsp Ca Ri Ni An Do (Vietnamese Indian Madras Curry Powder), 2 tblsp Nuoc Mam (Vietnamese Fish Sauce), 2 tsp salt, and a 6-oz can tomato paste. Then fill your pot about 3/4 full with water. When the water boils, turn the heat down to medium and let simmer for an hour. Meanwhile, prepare your other vegetables. I used pearl onions because I couldn't resist how beautiful they looked. You can dice a large onion instead. Chop up 2 carrots and 3 potatoes, or more if you wish. Keep the vegetable chunks at least several inches in size as they'll simmer for a while and you don't want them to become mushy or lose shape. Add the vegetables after the stew has been simmering for an hour. Taste and add fish sauce or salt if necessary. Turn the heat down to medium-low and let it simmer for another hour. After simmering for several hours, the beef stew meat and oxtails should be fall-apart tender. Fish out the ginger, lemongrass, cinnamon, and star anise. Serve with Vietnamese French bread, rice, or rice noodles. If you're feeling lazy, I've adapted this recipe for Crock Pot Bo Kho (Vietnamese Beef Stew) or you can even add puff pastry and make a Bo Kho (Vietnamese Beef Stew) Pot Pie. Who made my recipe for bo kho? Lan of Angry Asian Creations made some adjustments and said, "i've had bò kho for dinner and lunch since Saturday: with rice, with bread, and with noodles. i love it." Gi of A Los Angeles Girl in Iowa City said, "The results were wonderful: tender beef pieces swimming with bean sprouts and cilantro in a complex spice filled tomato soup base." Martian Foodie said, "This stew was a hit!" Lesbian Ham said, "Try it out, it's seriously good." 1 year ago today, Banh Tom (Vietnamese Shrimp and Yam Fritters). Ooh, this would be a great addition to our beef stew repertoire. Thanks! No takers for this!?! What kind of world do we live in! That looks awesome. Does anything taste better when it's cold outside? Not that it's ever cold outside where you are, but we're freezing our butts off, and this looks lie the perfect antidote. Thanks for sharing! I agree with ts, how can no one not want this? I'm totally going to make this this weekend. 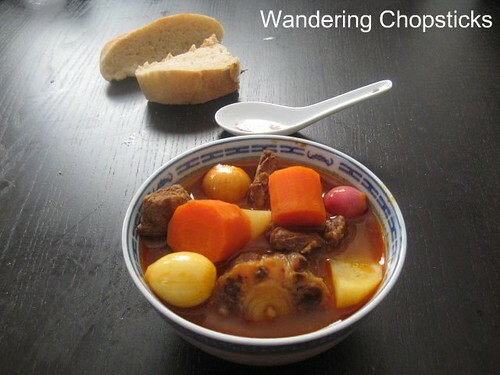 Wow, this is my wifes' all time favorite stew, thank you! 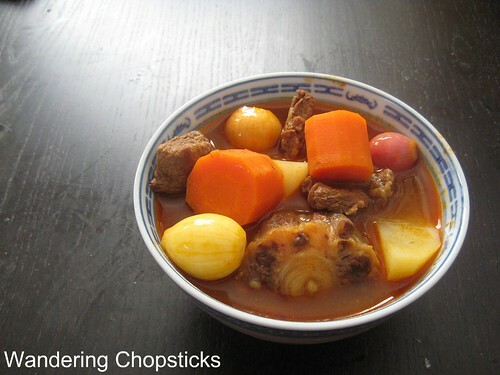 I will make Bo Kho this sunday. Must I also compliment your Bun Bo Hue and Pho Bo, I have followed your recipes and as a result, I have become the favorite sunday chef. This looks yummy! I've never had oxtail... is there anything you can compare it to? Also, is that cartilage in the center...? I loooooove cartilage. Do you ever use a slow cooker? I just bought one and this seems like it would be perfect for it! Could this be done without the oxtail. Would it kill a large amount of flavor? Maybe I could sub with beef neck bones? OK, I must be some sort of stalker at this point....but I just HAD to make this. Yesterday, I knew that I'd be staying home with the sick boy and I also heard that it would rain. I wasn't sure what I was going to make...until I got my daily dose of WC. I still have to work from home, so I decided to use the large crockpot that my Mom gave me for Christmas. I browned up all the meat bright and early this morning and put everything in the pot. In fact, I'm about to check if it is at a boil yest to that I can set my timer for an hour. Can't wait to add the carrots and taters. And speaking of which, our local Asian market had the LARGEST carrot's I've ever seen (perfect for 2" chunks)...seriously, the size of my forearms! Oh, and the meat. I got a whole oxtail. I usually have the butcher saw them for me, but they never hit the joint...which results in bone flecks and whatnot. It just ain't right. So I braved curring it myself. I was a little worried having observed what a hard time the guy had just cutting the thing in two to fit that bag. But it turned out to be pretty easy. I just used another X-mas present from my Mom, my handy dandy meat cleaver. Schwit, schwit, swhit, done! But the flank I got was another story. I've always wanted to know what cut of meat that was in Bo Kho. I always thought it was shank, and when I tried to get some at the store, I noticed a big bone. That didn't seem right...so I "settled" for the flank (not flank steak). Bingo, I think that's the stuff right? But I'll be doggone if it wasn't the most difficulty meat to cut ever. I'm pretty strong, but that connective tissue was tough and slippery! I ended up roughly hacking out the pieces I wanted with my Chinese cleaver, and then using kitchen shears to snip the connective tissue. And that was still difficult (I have new respect for "tissue"). Anyway, I went with a single star anise because I find that spice to be a bit strong for me. I also had to increase the amount of the other ingredients because the "whole" oxtail was way more than 1 lb. PS...fogive all the typos! I guess I've overly excited about the beast in the kitchen! Oh man, oxtail is my favorite. I'm going to try this recipe. I wish oxtail wasn't so expensive. It used to be so cheap when nobody wanted it. Thanks! Thank you so much for this recipe. I had this a couple times while in Viet Nam, and once here, made by a woman from Da Nang. I have attempted to make it before, but it was never quite right - it's nice to see the things listed that I left out (more than I care to admit!). I love oxtail, and I love your addition of cute pearl onions even more! Bo kho must be on my list of things to make soon! Well, I didn't send photos. Just updated my Facebook status to say there was bo kho if anyone wanted some. :P Glad to know I have you and JS for some. Too bad you're not 1,000 miles closer! Haha. My cousins get plenty of homecooking so they don't need mine. Make it. I'd love to see what you think. Oh that's wonderful. I love hearing about other people making my recipes. Can't wait to see how this Sunday's dinner goes. Oxtails have a bone in the center, but there is some cartilage too. I don't know what to compare it to. I think oxtail meat is "sweeter" though. You can certainly use tendon in the stew if you want lots of cartilage. I bet it'd work great in a crock pot. In fact, Jan Frederick is trying it in one so I hope it turns out well. You could use neck bones if you wish to save money. But honestly, the oxtails are what makes this stew so great for me. The beef stew meat is just OK, but the oxtails are just so delicious and make the broth so delicious. Sop it all up with French bread. Haha! You know I love your extensive comments on my recipes. It's great feedback. I have no idea what kind of meat is used for stew. I just bought the package of beef stew meat. But the long braising means any cut would work really. You know, with the lengthy comments on my recipes, have you thought of taking a picture and submitting it for Readers cook WC's recipes? I'd love to post it up if you do. Soooooo... how'd the stew turn out? I know! I hate how expensive oxtails are now, but oh, how I love the taste. I hope you try the recipe! I didn't realize how extensive the list of spices was until I typed out this recipe. 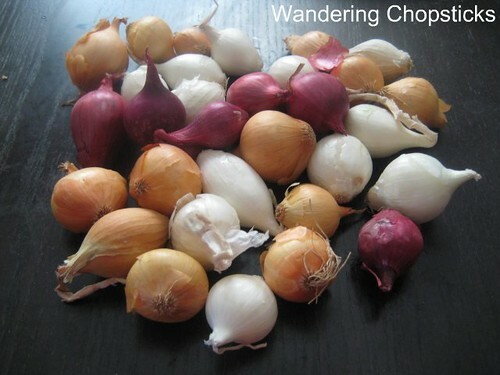 It seems like a lot, but they're all important for the overall depth of flavor in the stew. Blame Trader Joe's. Those pearl onions are pretty pricey, but I just couldn't resist! u really made me interested in sampling all these delicious Vietnamese foods such as this hearty stew; can't wait to visit Vietnam one day! i love love love bo kho. this is actually something i've been thinking about making too, along with bun bo hue, since it's so friggin cold. but like you, i'd be the only consumming it. surprisingly, this was not made often in my house growing up. i like american beef stew but there is just something about the flavor of the vietnamese version that hits the spot. i also prefer it with banh pho. Hey, I never noticed that section of your site before. Dang, and it looked so pretty in the bowl with a sprig of cilantro and a nice crusty mini-baguette beside it...should have snapped a picture. I'll have to remember to do that next time. It was delicious! When my wife came home she remarked that our house smelled like a Vietnamese restaurant! We adore oxtails, and I absolutely love Bo Kho...so I HAD to make this. The meat just fell off the bones. I wish I'd made it the day before and had the patience to wait a day of course, but there are plenty of leftovers. That cartilage and marrow just melts into the broth and provides an excellent vehicle for all those lovely spices. I'll definitely make this again. Thanks again! Haha. Thanks. I hope you do try. Well, I guess that just means you'll have to make it again and photograph it. Or photograph the leftovers and do a write-up for me? It was a blanket invite, but you weren't around when I made this anyway. All those spices come together really well though. They're all necessary for the overall flavor. Yay - bo kho recipe. I've been meaning to muddle around to make this for ages. Will probably still take me ages to make it, though. Any suggestions for replacing the annatto seeds? Or do you know if they have another name? I can't seem to find them anywhere, not even from online spice stores. You can do without the annatto seeds. It just won't be as red. Supposedly they add a bit of natural sweetness, but I think all the other spices will make up for it. Annatto seeds are also called achiote seeds. In VNese, they're called "hot dieu mau." I get mine for pretty cheap from the Asian grocery store. Let me know if you want me to mail you some. Mmmmmm I love Bo Kho, especially when there's bits of meat with lots of tendon and connective tissue. Yours looks delicious! Thanks. It's definitely the tendon and connective tissue that makes oxtails so yummy for me. Gives it that extra depth of flavor after a long braise. Thanks for the offer - you're a superstar. I was wondering how you made due with bun bo Hue without annatto seeds, but saw you cheated with chili oil. You can do the same here? Although, it's no trouble to send. They don't weigh much. I hope the abbreviated version still gave you good results! Thank you! And it was so easy. I can't believe it's taken me this long to try. No annatto seeds, and no chilli oil either (I've run out and too lazy to buy more) but still a great meal. We ate it with bun. This recipes looks great. But could you elaborate on what "beef stew meat" is? Yay! It looked great. My pot lasted me a whole week too. But it's been raining a lot this winter so I made another beef stew recently. 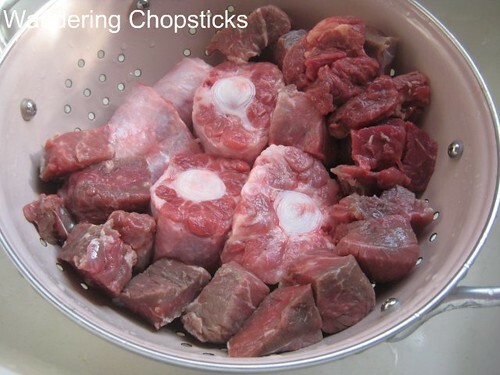 You can use any cut of beef really, but stew meat tends to be cheaper cuts that will hold up to a long braise time. It's simply labeled "beef stew meat" at the store. Oh my gosh!! So the man wanted me to make him bo kho which is his favorite, I haven't had it seen I was a teen (I am 6 mos away from being 30 right now), and I forgot how it's even supposed to taste let alone make it!! So I went to my local Asian Market and noticed they had bo kho boulian(sp? ), I was like SCORE!!! The lady at the market noticed I was attempting to make this treat and I commented that I had no idea what I was doing. She gave me VERY VERY VERY simple instructions for which MOST of the ingredients you have listed above weren't even included!!! (No wonder the bf didn't think my stew tasted quite right, haha). I purchased the seasoning mix for bo kho, which I am guessing since it was red had all those seeds you have listed already in it. Then I marinated it with chopped up garlic like she told me to do. I marinated it overnight thinking it would give it more of an intense flavor, the next day I browned the meat, added it into chicken broth (like she told me) threw in some carrots, salt and my bo kho boulian...are you laughing at me yet? NO ONE told me about the bay leaves, onions, or even LEMONGRASS!! The bf only knows how to eat Viet food, can't even describe to me what was "missing" in the flavor till a couple days later when he said, "those stick things" Yeah, lemongrass honey, thanks for nothing. So now I have a HUGE pot still...and I used expensive beef flank and brisket and wondering if I can fix it :( I was thinking about going out and getting some lemon grass and bay leaves and seeing if I can't fix it. I mean, I would assume the curry, annatto seeds, cinnamon and anise flavors were already in the boulian....what do you think? I have no idea. I usually don't cook from pre-made seasonings since they usually contain MSG and other additives. As you said, the ingredients in my bo kho are not the ingredients in your mix. Your mix most likely has red food coloring rather than annatto seeds. 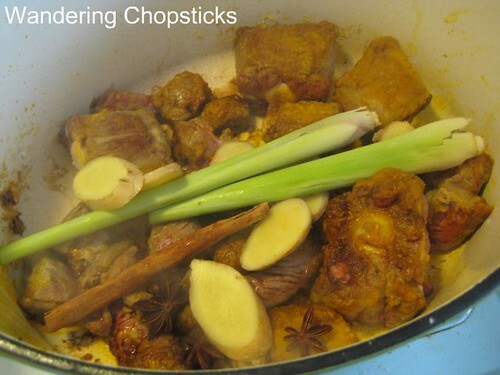 My best advice would be to make my recipe and add all the spices such as the curry powder and five-spice powder along with lemongrass and bay leaves. A bouillon cube has mostly MSG and additives, it doesn't have those spices, otherwise, your bo kho would have tasted as it's supposed to. Honestly, unless those ingredients are listed in the packaged mix, you're not going to get the right flavor. 35 comments... second on Google search only behind recipezaar. Damn impressive. Feed me and I'll read it. I think that's how everyone should organically grow from now on. Folks, I'm giving away FREE ice cream if you comment. That's right. Delicious Delicious Delicious! Thanks for your recipe. My husband is Vietnamese and on my first attempt it came out perfect! Ha! Make an offer like that and I expect lots of free ice cream. I still haven't tried the ca phe sua da or lavender honey! Aww, thanks for trying my recipe. I'm so glad it came out well. Thank you for sharing this recipe! I tried it this weekend and it turned out great. I'm excited to try out your other recipes. If I wanted to make twice as much, would it be ok to add twice of all the ingredients? I'm not sure if adding twice as much star anise or ginger make those spices too strong. Star anise is pretty strong so I don't think you need to add more. Ginger depends on your preference. I would double the amount of curry, but keep the same amount of 5-spice powder and other ingredients. Near the end, you can taste and see if you need adjusting then. WC, I made the stew and loved it. I noticed that it wasn't as fragrant or spice-forward as I've had it at vietnamese restaurants. I simmered the stew for 5 hours, and am wondering whether it's possible that cooking the meat that long might have caused the meaty taste to overpower the spices? Whoa. Five hours is a long time. I only simmer it for about two hours. Did you get it mixed up with the Crock Pot version, which is cooked for five hours? Otherwise, if you like more spices, add more. It's all up to individual taste. So great to hear! That's a lot of sugar! I don't have much of a sweet tooth myself so I rarely add sugar to my savory dishes. All those condiments and garnishes sounds like you're very familiar with Vietnamese food. I learned a lot because my ex whom I was with like 1 year was Vietnamese and his family were pretty good cooks, and always had awesome dinner parties and I'd go to wonderful potlucks where Vietnamese food abounded. Plus the area where I live (Reseda, Canoga Park area there's somewhat of a Vietnamese community, Pho shops, other restuarants, and some stores plus Chinatown in LA is mostly Vietnamese now days) but yup yup I love your blog helps me cook some of those yummy foods I crave sometimes that I didn't learn to cook :) however I did remember the names so I'm able to luckily look it up LOL. I always say the best way to learn about food is through someone else introducing you. Sounds like you retained quite a lot from that relationship. Hi when you brown the meat, do you use the annatto seed oil in the same pot or you use a new pan with different oil? I also want to do 3-4 times the meat of the recipe, so do I just do 3-4 times the other ingredients? Does the cooking time increase with a bigger batch being stewed? Thanks in advance. I use the same pot, no need to dirty another one. three to four times the meat, that's a big batch! You could double the meat with these same proportions and be fine, but three to four times the meat, I would triple the ingredients. If it's too dense or too flavorful, you can always add more water. Total cooking time should be the same though if your pot is big enough to hold it all. Two to three hours of stewing should be just fine. Hi thanks for the quick reply. I can't wait to try this recipe. What I wanted to find out was do I use the annatto seed oil to fry the meat or use new oil to fry the meat. The reason I ask is because 6-8 pounds of meat is a lot to fry especially being cover in flour, so the annatto seed oil might not be enough. Increase both the amount of oil and annatto seeds to make enough oil for all the meat. 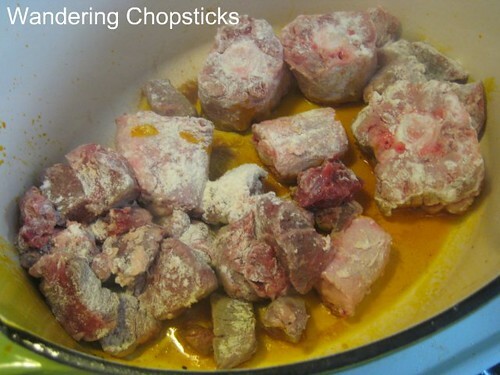 You'll probably want to do it in batches and put the browned meat into a separate bowl until all the meat is fried, then put the meat back into the pot. If you need more oil, just use regular olive oil until it's all done. You can always make a small batch of annatto seed oil later if you want the stew redder. Or use annatto seed powder instead so the stew isn't too oily. Good luck! Let me know how it turns out. I made this recipe for my boyfriend the other night. He's Vietnamese and he loved it! He ate two bowls in one sitting! I've tried other similar recipes and they all called for the Bo Kho seasoning packet -- I tried several different brands and they all taste weird and different from one another. I'm so glad I found your recipe. I can toss out all the leftover bo kho seasoning leftover packets piling up in my pantry. :P I only made one substitution: I used star anise powder (2 tsp) because I have a whole bottle barely used that I purchased for a previous recipe I tried. I'm sure the stew would be more robust in flavors if I used the actual spice. Anyway, thank you so much for sharing! That's awesome. I love hearing comments where you've tried other recipes and like mine best. :) Did you see one of the comments up that said they used a spice packet that didn't have any of the ingredients in my version of bo kho and asked how to fix it? I said not to use spice packets. :P I don't like seasoning packets since most of them are full of MSG. I just scrolled up and read the comment you were talking about. LOL I was actually on the exact same boat as the commentator, Cappy Cat. My boyfriend only knows how to eat. The few times I tried making Bo Kho they all came out "weird." Anyhoo (sorry for the uber long comment :P), my boyfriend love eating bo kho with French bread. I found your No Knead Bread recipe and I can't wait to try it. Fresh baked bread is heavenly! 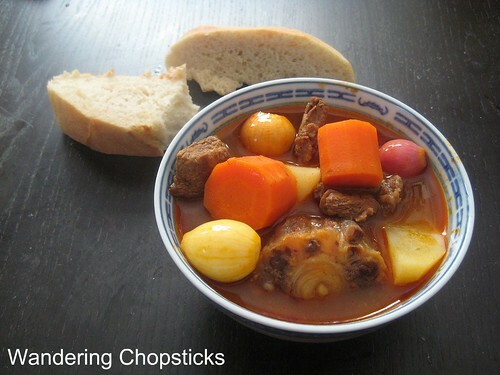 Would that bread go well with bo kho? Thanks for the follow-up comment. What a great thing to wake up to this morning. My mom adds a pinch of MSG to food too and sometimes adds some packets to things. And honestly, I can always taste when she does. The No Knead Bread recipe isn't really mine, just a lazier adaptation of the original version. But yes, it goes great with bo kho. Yay! Another Oregonian. And babies! Enjoy your time with the little one. They grow up so fast. And do let me know if you try any other recipes. We have guests today for lunch so I made the stew yesterday and left it in the thermos pot overnight. I couldn't find annatto seeds or Madras Curry Powder so I substituted with red curry paste and all the guests said that it's very good and they finished the whole pot I didn't have any leftover. 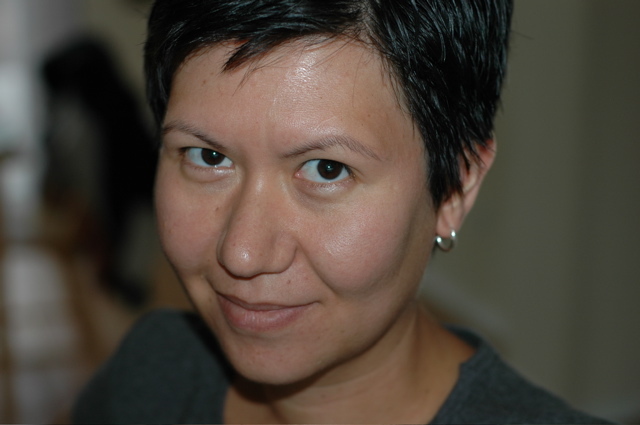 Thank you very much for taking your time in creating the tutorial with beautiful pictures. Thanks so much for telling me how much everyone liked my recipe! I'm so glad it worked out for you. I am having a hard time finding the annatto seeds. Any suggestion as to where to buy it in southern cal (LA area)? Thanks. They're also called achiote seeds. Have you looked for either word? They're really common and I've seen them in large and small markets. I bought a huge container for a few bucks at the San Gabriel Superstore years ago and still haven't used it all up yet. So any of the Shun Phat chain should have it. I also have the powdered, ground version from Super-A, or any Mexican-centric market should have it as it's a common ingredient in Yucatecan cooking as well. Go to a store that has popular Mexican spices in individual bags for about a buck or two and you'll find it there. Otherwise, if you really can't find it, it's OK. It adds nice color and a slight sweetness, but isn't as necessary for taste as the 5-spice or the curry powder. I just made this dish and it's very good!! Using all fresh ingredients really heightens the aroma and depth of the stew. I did add 1 tbsp fish sauce and 1 tbsp sugar at the end. I'm not sure why, but the broth is not as nice and clear as yours. It's much thicker. Any suggestions? Yum! Great recipe, thanks! I topped mine with some fresh Vietnamese basil, coriander and Thai basil. Great additions. Add a squeeze of lemon or lime too to finish it off. 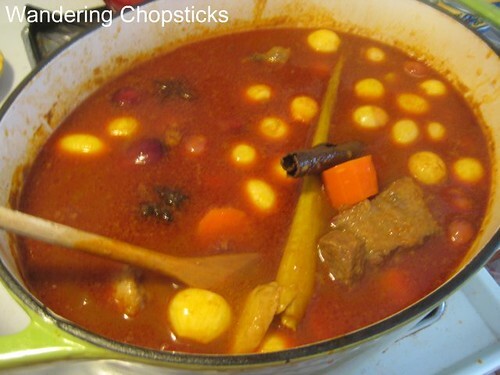 This is prob the most and complete Bo Kho recipe I've seen on the net. I've added some personal touches like using half water half beef broth for that extra oomph. Btw for years in our home this recipe is like a dice roll because sometimes the beef is tough or dry and it would ruin the whole pot. So this year I finally got a decent wolfgang puck pressure cooker of HSN and it totally revolutionized this recipe and I found out this is why the restaurant's was always so good and tender. What's great is that it shortens the cooking time to only 45 then the last 10 min with the carrots and the meat came so tender and soft with deep intense flavor. 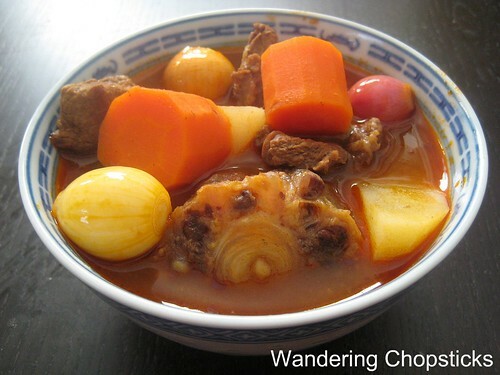 You can find a cheap one on ebay and it's worth it just for this recipe esp if you eat bo kho often. Thanks! It amazes me how many likes and shares and comments this recipe has gotten. Pressure cookers are great for reducing cooking time. I love this recipe! Where we live, in the Southeast of the US, it's really COLD right now. I had cleaned out the freezer last week and found the package of tendon that I bought a while back and I knew that this was the perfect recipe. I made it yesterday along with some homemade French bread. I thought my husband was going to kill himself trying to hurry up the stairs for it. We had it and it was great, really great, but we're having the leftovers tonight and I'm betting that it will be even better since it got to sit and marry overnight. Thanks again for a killer recipe! Aww. Your comment brought a smile and made my day. I could just picture your husband running up the stairs with eagerness. I love tendon! So yummy. Because it's healthier, and with the exception of sesame oil, which oil to use doesn't really affect the taste of the overall stew pot. You can use whichever oil you wish. I have a Vietnamese-American kitchen. I don't adhere to strictly traditional ingredients or techniques so that means I substitute olive oil when possible or use shortcuts such as the Crock Pot. Also, assuming that Vietnamese-Vietnamese people wouldn't adapt to changing health concerns seems "out of place" to me. Culture isn't static, and neither is cuisine. Great to hear. I'm glad it worked out for you. Made this just now....oh.my.yum. Love your recipes . Mom will be impressed. Ha! So odd to see your comment on the blog when I'm so used to seeing it on the Facebook page. But always happy to hear when something turns out well! This has become a firm family favourite in our house; even with those who don't usually enjoy red meats. Delicious! Yay! So great to hear. Hey have you thought of adapting this recipe for the Instant Pot? I used parts of this recipe today in the Instant Pot. Thanks!